A lot of time and energy is spent trying to divide life into this or that. Rather than accept that things are shaded in gray and deal with the murkiness that idea involves, people instead try to make things easy on themselves and group things into a series of good and bad or right and wrong. Truthfully, the two things aren’t exclusive from each other–that’s the messiness of living–people will make mistakes, try to fix them, make more mistakes and let the worst aspects of themselves get the best of them. It may be easier to ignore these aspects of life to make things neater, but it isn’t the right call. A lot of art concerns itself with wrestling with the dichotomy of right and wrong and dealing with inner demons. 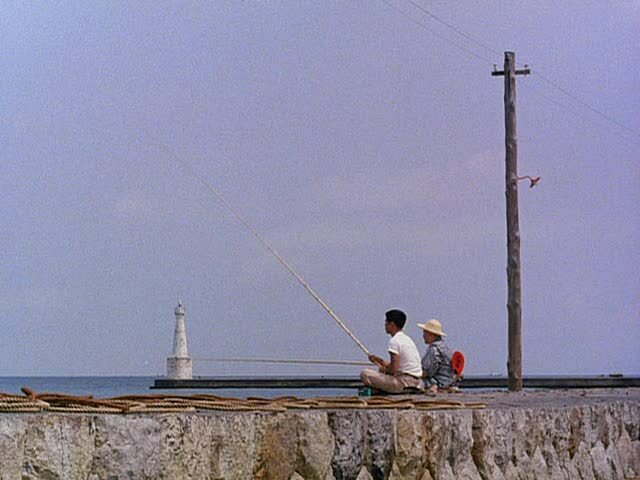 With Ukigasa, or Floating Weeds, Yasujirō Ozu paints the picture of a man whose life is filled with regret and a womanizing past and present is in conflict with an attempt to do right by a son who doesn’t even know him. The film follows a traveling theater troupe lead by the lead act and owner, Kumajuro. The troupe makes a stop in a small town by the inland sea where the performers go about publicizing their kabuki performances, while Kumajuro pays a visit to his former mistress, Oyoshi. He reconnects with his son, Kiyoshi, who’s grown up and is saving up money in order to attend University. Kiyoshi doesn’t know anything about Kumajuro and believes he is his uncle. When Kumajuro’s current mistress, the lead actress of the troupe Sumiko, learns of this, she becomes jealous and tries to cause problems amongst him and Oyoshi. After Kumajuro ends their relationship, she pays one of the young actresses money to seduce his son Kiyoshi. Ultimately, the two young people genuinely fall for each other, despite Kumajuro’s distrust of her after learning of Sumiko’s plans and when it’s time for him to reveal that he is indeed Kiyoshi’s real father, he finds that it’s much too late for him to decide that now is when he wants to be a real father. Familial issues are always a strong subject in film, television or music. It strikes a chord with a lot of people even if the story isn’t specifically theirs. Kumajuro wants to do what’s right in the situation he’s given but part of the problem is, he wants to do what’s right ONLY because of this situation is giving. He’s a rolling stone, touring with his acting troupe, he’s womanized and continued to womanized, he comes and the he’s gone in the same breath. His son has grown up and become an adult without his help. The idea that now is the time he wants to be a family would come off to anyone as inauthentic and ridiculous, let alone to his own son. It’s not that you don’t feel any real feelings of love from Kumajuro, it’s that that idea of love isn’t enough. when the two o them go fishing and Kiyoshi talks of going to University, you get the sense that he’s figured out a good portion of what he wants for his life. He’s done this without Kumajuro and that fact isn’t lost on him. There’s no instruction guide on what you’re supposed to do in life on any given situation, and the sense you get is that Kumajuro is a man who’s dropped the ball without even fully realizing it. Good intentions aren’t enough but that doesn’t mean they don’t matter. It’s good intentions that eventually caused Kayo to do the right thing before it was too late. Kayo was the young actress paid to seduce Kiyoshi but instead found herself falling for him. She knew that she was wrong and didn’t want to hurt him so she confessed to it. Kiyoshi and Kayo’s fling was endearing and delicate; the spirit of young love and infatuation, the sense of adventure when you first meet someone and get to know them and the adrenaline rush of getting so caught in those feelings that you’d be willing to abandon your life and plans just to pursue them. Kayo warns Kiyoshi that she’s trouble and he has his whole life ahead of him but, as anyone who’s been 17 will tell you, those kinds of statements fall on death ears. What started as a mistake my by her becomes an opportunity for the both of them to find happiness and not just try and construct it like Kumojuro tries to. Part of the beauty of this film is that it’s not here to judge or be cynical about its characters. It sits back and watches them wrestle with their insecurities, their problems, their choices and their beliefs. Kumajuro is a volatile, pathetic old man and yet by the end of the movie you feel for him. Sumiko lets her jealousy envelop her and make her foolish, but you can see that she cares for this old man dearly and has been there to pick him up when he needs it. You can even watch Kiyoshi let his youthfulness get the better of him at times, making him think with his heart instead of his head, but you know how that feels because you’ve been there too. The beauty of the film and the way it’s shot with care is similar to the characters’ portrayal. They’re beautiful and approached with care. There is sadness to the story with moments of sweetness strewn about. Weeds are still flowers and even in the ugliness there’s beauty to be found.